LONDON, April 30 (Reuters) – China's trade in industrial metals looks set for significant upheaval this year as the country adapts to fast-evolving supply chains. The aluminium market is reeling from the devastating one-two of U.S. tariffs and sanctions on Oleg Deripaska's Rusal empire. China, the world's largest aluminium producer, was the main target of those tariffs but might ironically turn out to be the saviour of the market in the form of alumina exports, a highly unusual phenomenon. China, meanwhile, is itself changing supply chain dynamics in the copper market. A flurry of new scrap import regulations has caused headline imports to plummet as flows get redirected. The country's trade patterns are evolving across the metallic spectrum as they adapt to reflect divergent market drivers. Aluminium exports today, alumina tomorrow? 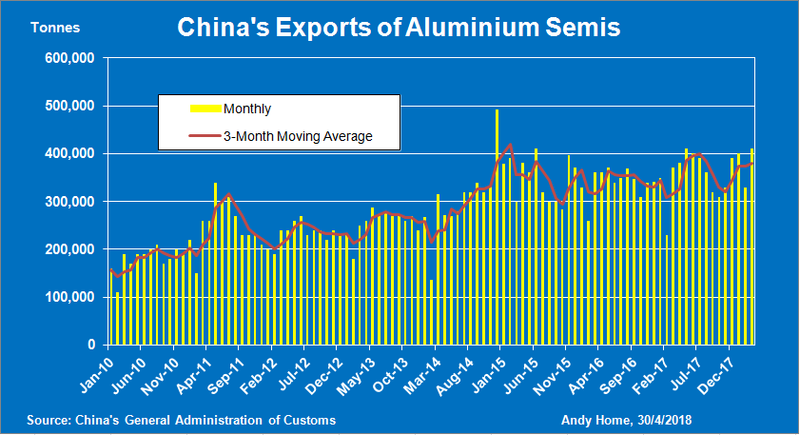 China's trade in aluminium is dominated by its exports of semi-manufactured products ("semis"). Exports were strong in the first quarter of this year, up 20.5 percent at 1.14 million tonnes, and are on track for a record year if they maintain this pace. Domestic oversupply, as evidenced by high stocks on the Shanghai Futures Exchange, and a yawning arbitrage window are pushing more product into the global market. This "semis" surge, however, is going to crash against the newly-erected tariff and dumping-duty wall raised by the U.S. administration, likely amplifying the disruptive effect in other regional markets. While the rest of the world pushes back against China's exports of aluminium in this form, the sanctions-induced market chaos has opened the door to exports in other forms. China has historically been a net importer of alumina, taking in 2.87 million tonnes of the raw material last year. But the sanctions hit on the global alumina supply chain has incentivised exports with suggestions that up to 500,000 tonnes are being prepared for overseas shipment. Alumina exports remained marginal during the first quarter at just 11,400 tonnes, much of it possibly specialty-grade material, but that will change over the second quarter. Copper scrap – all change? China's refined copper imports were robust in the first quarter of 2018, up 6 percent at 853,000 tonnes. Last year's base is a low one, however, since the country's import appetite for refined metal fell by 11 percent to a four-year low of 3.24 million tonnes in 2017. 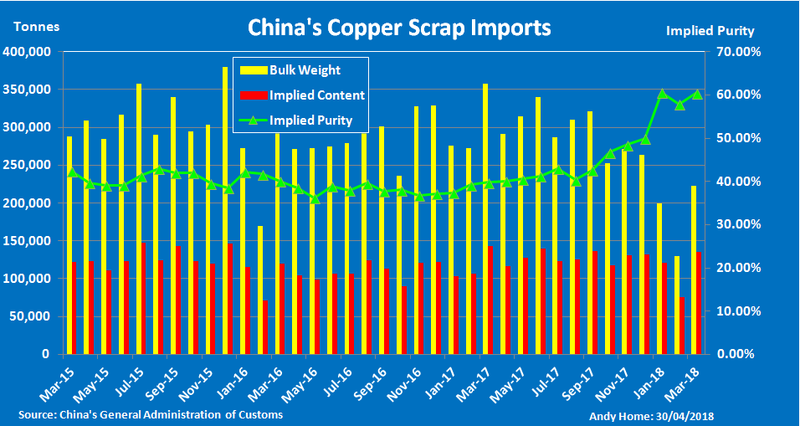 A key determinant of this year's refined metal trade will be what happens to China's imports of copper scrap after a flurry of rule changes by Beijing. At a headline level scrap imports plunged by 39 percent to 553,000 tonnes in the first quarter of the year. However, the average value of those imports jumped, implying a sharp rise in the average copper content to almost 60 percent from a recent historical norm of around 40 percent. The first-quarter hit on copper units, therefore, was probably much less than implied by the headline drop. That said, this is going to be a moving target as China's newly-created Ministry of Ecology and Environment steadily tightens controls across the waste materials spectrum. The shift in copper purity levels so far this year is likely a first-stage reaction to the looming ban on imports of lower-grade No.7 scrap. Such material is now being diverted to other Asian countries for disassembly and cleaning before being shipped to China. Thailand and the Philippines both shot up the list of scrap suppliers to the Chinese market last year and by bulk weight they were 11th and 12th largest supplier respectively in the first quarter. 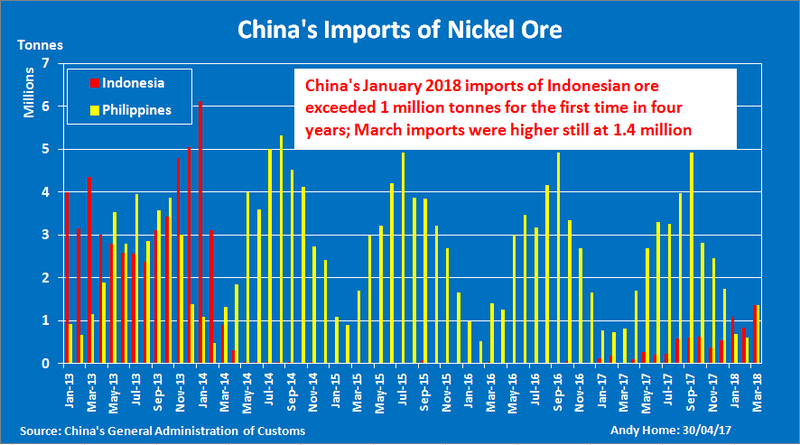 Refined nickel imports rose 40 percent to 61,000 tonnes in the first quarter, but as with copper, this was from a low 2017 base. Moreover, the increase was dwarfed by the doubling of imports of nickel ore and concentrates. Imports from Indonesia are rapidly accelerating after that country partly lifted its previous ban on ore exports. Flows of 1.4 million tonnes in March were the highest monthly total since the ban was imposed at the start of 2004. Shipments of ore from the Philippines, meanwhile, seem to be running smoothly despite renewed conjecture about the government's ongoing environmental crackdown on its mining sector. Cumulative ore imports were up 16 percent in the first quarter. Raw materials feast should in theory mean reduced appetite for imports of refined metal but this old rule of thumb might be increasingly questionable when it comes to nickel. The nickel supply chain is morphing into two distinct components, one based on nickel ore feeding the stainless steel sector, and one comprising higher purity metal for use in superalloys and lithium batteries. Previous trade patterns may not apply as this process accelerates. China imported 140,000 tonnes of refined zinc in January-March, up 141 percent on last year's tally. The headline jump, however, is also flattered by a low base and import momentum noticeably faded over the first quarter after the 224,000-tonne surge seen in November and December. Interestingly, tightness in the raw materials market hasn't noticeably impacted China's ability to source zinc concentrate. Concentrate imports by bulk weight increased by 22 percent last year and were up another 23 percent in the first quarter. Lead was one of the bull themes in China's trade last year, the country flipping to significant net importer of refined metal for the first time since 2009. The first quarter of 2018, however, saw a return to the status quo ante with imports imploding to just 328 tonnes and the country flipping back to net exporter to the tune of 7,650 tonnes. Tin exports – raw materials warning? China's net imports of refined tin have been dwindling for several years and totalled just 1,800 tonnes in 2017. The country was a net exporter in all three first-quarter months with the cumulative total standing at 1,200 tonnes. More may be leaving the country in other forms of the metal that don't get picked up in the headline trading figures. China's imports of tin concentrates from Myanmar, a major source of raw material in recent years, fell to a three-year low of 8,004 tonnes in March. The flow of material usually drops around the Chinese New Year holidays but the effects this year seem to be longer-lasting and will add to questions about the sustainability of production at the Myanmar mines.